Join us in a sleepy Mexican village on Isla Cedros, BCS, Mexico. 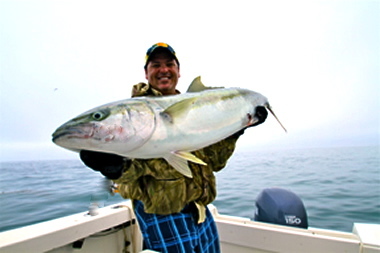 The waters surrounding Cedros offer world class Yellowtail from 15-40 lbs and Calico Bass to 12 lbs and it's just a short (5-15 minute) super panga ride from the harbor. The summer months bring these fish near, or to, the surface, crashing bait. This makes for the supreme fly rod experience. Cedros has been a go to destination for conventional anglers for quite some time now but, fly rodders have been few and far between. Fishing is from super pangas, two anglers per boat, and the fish can be seen chasing bait, squid, mackerel and anchovies, on the surface. Besides the schools of Yellows off shore and Calicos in the weeds there are White Sea Bass, Bonita, Barracuda and all the other species you would expect to find in So. Cal waters. All inclusive package from San Yisdro, CA includes round trip transfer to Ensenada, round trip air from Ensenada to Cedros, four nights food and lodging, and three and one half (long) days fishing with two anglers per panga. Does not include gratuities, alcoholic beverages, and Mexican fishing license. First date is filling up fast. Please call Ken or David at The Spot (818) 785-7306 to reserve your spot or get more information for this amazing trip.